1. Heat the oil in a medium frying pan and fry the onion for 3-4 minutes. Add the rice, garlic and lemon zest and cook for 1 minute. Gradually add the stock, cover and simmer gently until the liquid is absorbed and the rice is tender (about 15-20 minutes), then stir in the lemon juice. 2. 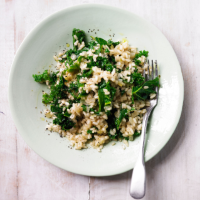 Meanwhile, cook the spring greens and kale in boiling water for 4 minutes, drain well and mix into the rice.